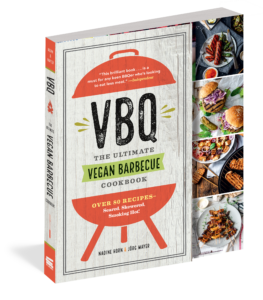 Over 100 mouth–watering photos prove it: VBQ takes everything you love about BBQ and adds a kick of color, creativity, and flavor. Plus, Horn and Mayer’s illustrated guide to tools and techniques takes the guesswork out of using a chimney starter, getting the perfect char on your asparagus and tofu, and more. You’ll be a vegan pitmaster in no time!